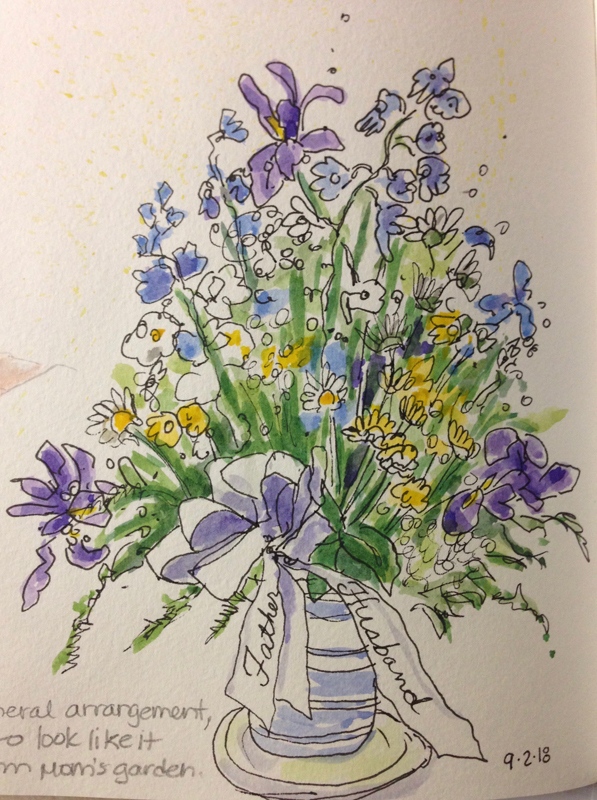 Flowers can be such a blessing and today I offer a couple sketches of flowers in vases. This first sketch is of an arrangement for my father’s funeral that we had back in August. We wanted something that looked like it had just come out of my mom’s garden, and the florist provided the most beautiful purple, white, blue, and yellow flowers, with plenty of greenery as well. It was stunning! Last week I got a beautiful birthday bouquet from my co-workers, and I have been enjoying it very much. In the dead of winter, it is so nice to have color in the house, and these beautiful yellows, pinks, and greens are such a wonderful blessing. I just had to sketch it before the flowers all turned brown and died! It’s a wonderful memory from a wonderful birthday celebration with family.